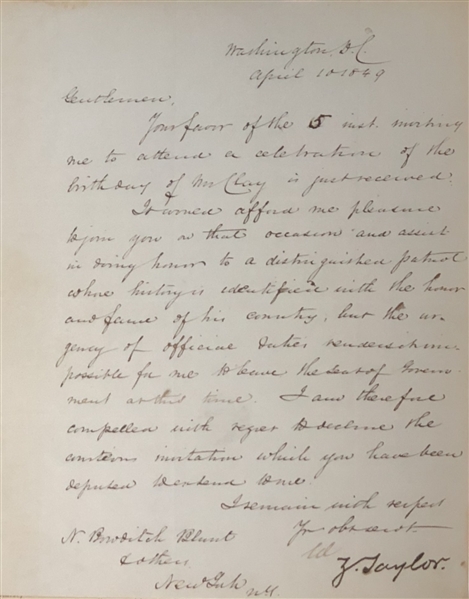 Zachary Taylor letter signed as President, during the period of only 16 months when he served as Commander-in-Chief, thanking a Nathaniel Bowditch Blunt for the invitation to Henry Clay's birthday celebration. Datelined Washington DC April 10, 1849. In Full: Gentlemen, your favor the 5th been inquiring need to attend the celebration of the birthday of Mr. Clay is just received. It would afford me pleasure to join you at the occasion and assist in doing honor to a distinguished patriotic when history is identified with the honor and fame of his country, but the urgency of official duties render me impossible for me to leave this state of government at this time. I’m therefore compelled with regret to decline the invitation while have you been to send one. I remain with respect your obedient Zachary Taylor [signed] Z. Taylor''. Letter measures 8'' x 10 N. Bowditch Blunt & others New York , NY Nathaniel Bowditch Blunt (c. 1804 in Newburyport, Essex County, Massachusetts – July 17, 1854 in Lebanon Springs, Columbia County, New York) was an American lawyer and politician from New York.